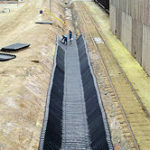 The SmartDitch MegaDitch is an expandable channel lining system specifically designed for the rehabilitation of very large, concrete-lined and earthen ditches and canals. 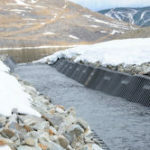 MegaDitch is a dependable solution for new construction, stormwater drainage, erosion control, irrigation, industrial site containment systems and mining site water run off applications. 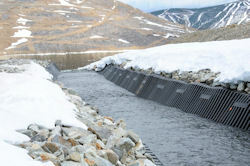 MegaDitch is engineered with adjustable sidewalls to conform to the variety of slopes and grades that are typically found in these unconventional large water flow applications. The base and wall sections are connected for maximum expandability and fit both flat-bottom and V-bottom channel profiles. 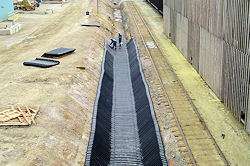 Multiple bases and sidewall sections can be connected to any desired length or width. Figure 17 shows a one base wide and one wall high (135°) MegaDitch cross-section. and wall sections can be trimmed by PendaForm to create any combination of sections to provide the required channel size.